QuickBooks is accounting software used mainly by small- and medium-sized businesses. 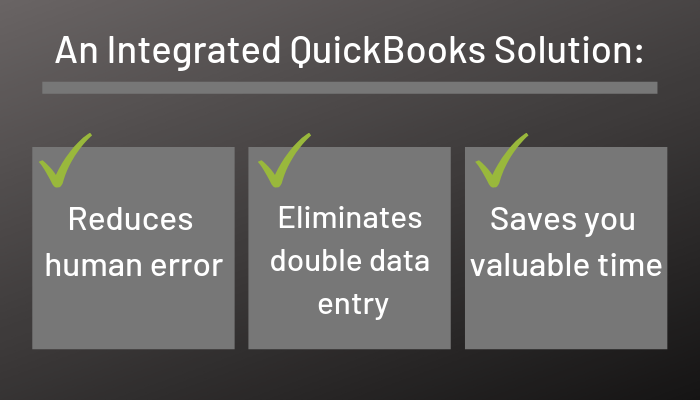 QuickBooks users can record transactions, manage bills, track projects, create invoices, and more. As one of the most popular accounting software programs available, QuickBooks is very user-friendly and helps many businesses stay organized and manage cash flow. Merchant services are a category of authorized financial services designed for businesses. Typically when people talk about merchant services, they’re referring to payment processing, which allows businesses to accept credit card payments. However, merchant services can also include gift card and loyalty programs, payment gateways, merchant cash advances, and point of sale (POS) systems. Now that we’ve gone over QuickBooks and merchant services, let’s go back to our original question. QuickBooks merchant services refers to merchant services providers (AKA payment processors) that allow you to accept payments inside of QuickBooks. If you currently use QuickBooks and want to accept credit cards, then you need to find a merchant services provider to process card payments. Here are the top three factors to consider when selecting a merchant services provider. If you want a more extensive list, check out how to choose a payment processor for QuickBooks. Payment processors are notorious for overcharging businesses. They impose an assortment of fees under a variety of names and titles. Many merchants believe these fees are legitimate, unavoidable costs that simply come with accepting credit cards. But that’s not true. Transparent pricing. A good payment processor won’t try to hide their fees from you. All fees should be upfront and easy to understand. Per-transaction fees. Almost every payment processor has per-transaction fees. If your business runs a lot of small-ticket transactions, then make sure you get the lowest per-transaction fee possible. Flat rate and interchange pricing. Any reputable processor will have flat rate and interchange pricing options available. 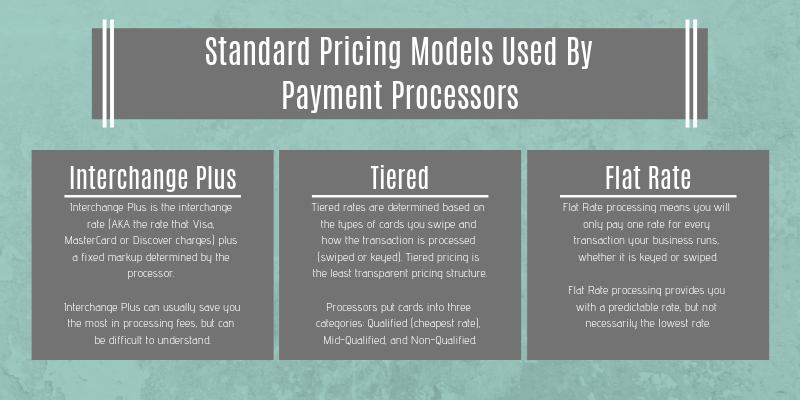 Don’t sign up with processors that only offer tiered pricing, because it’s the least transparent pricing model. Successful companies cut down on costs wherever possible. Recurring fees, like those from a payment processor, need to be analyzed often to make sure your company is getting the lowest rates possible. All too often, businesses overlook customer service when choosing a merchant services provider. Don’t make that mistake. Customer service can make or break a business. How do you think Amazon came to be the retail giant it is today? Amazon’s mission statement is “to be earth’s most customer-centric company.” One of the reasons they have done so well is because they put the customer first. People are drawn to that type of service. Everyone craves convenient, live customer support. Just as Amazon places the priority on the consumer, your processor should value you as their customer. You can avoid headaches and complications down the line if you prioritize customer service when selecting a processor. If your transactions aren’t going through, your statement seems off, or you want new hires to see a demo, then you’ll want to have a reliable support team ready to assist you. Notify you of chargebacks and help you resolve them. Provide you with a relationship manager so you have one main point of contact. Have a trained, in-house support team with a quick response time. No matter how stellar a processor with low rates may seem, never disregard the power of great customer service. Figure out what type of customer service is provided before you sign up with any processor. An in-house, 24/7 customer support team will throw you a life preserver when your business is drowning in chargebacks, technical issues, or processing problems. Ah, integration. It brings joy to so many accountants. Integration fuses your payment processing with your accounting software. That means your accounting software will automatically reflect every transaction you run—and you don’t have to enter the information twice. See why it’s worth talking up? Accepting payments directly in QuickBooks gives you the benefit of automation. The integration automatically posts payments to invoices and marks them as paid and reconciles your accounts receivable and general ledger. If you haven’t been using an integrated system, then your head is probably swimming from how much manpower you’ll save by switching to integrated payments. But before you let your imagination run wild, you need to find an affordable payment provider you can trust to help your business flourish. Our payment gateway, EBizCharge, isn’t your typical run-of-the-mill payment gateway. Just as a red flower in a field of white daises stands out, EBizCharge has a way of catching the eye when compared to other payment providers. Since EBizCharge seamlessly integrates with QuickBooks, the only change you’ll see is your ability to accept payments. Everything else will stay the same. EBizCharge is also one of the few payment providers that supplies a customer payment portal. This portal allows your clients to view and pay their invoices online. As more and more people turn to the internet to pay their bills, supplying your customers with the option to pay online will significantly increase your likelihood of getting paid. A payment portal also saves you time by enabling customers to make payments or view past invoices without your involvement. Beyond the payment portal, EBizCharge provides convenient features that make your work life easier. Automatic email reminders can be customized to send email notifications to customers with upcoming payments. These routine reminders encourage your customers to pay their invoices on time and free you from time-consuming follow-up calls and emails. EBizCharge also saves your customers’ credit cards so recurring transactions are efficient and smooth. Our PCI compliant gateway ensures that payment data stays secure and will give you peace of mind when it comes to preventing data breaches. EBizCharge is also very affordable for small- to medium-sized businesses. We can reduce your credit card processing fees by up to 43%. If you have further questions about what QuickBooks merchant services is or want to see a demo of our QuickBooks integration, give us a call. Our live, in-house support team is always on standby to answer your questions and give you a free cost savings analysis. Amelia specializes in credit card processing and enjoys helping businesses save on processing fees.